Where is Jesus in "The Bible"? You are here: Home / Where is Jesus in “The Bible”? Where is Jesus in “The Bible”? 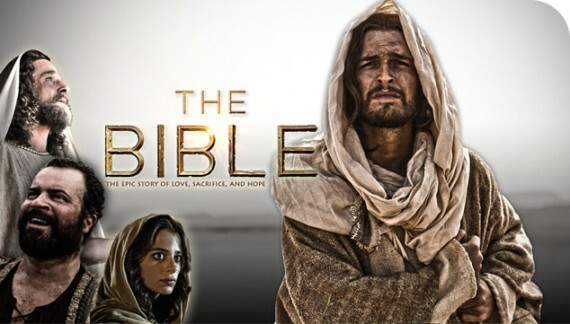 My wife and I decided that as part of our Easter celebration this year, we would begin watching the History Channel TV miniseries “The Bible” with our three daughters. I am sure people have reviewed this miniseries to death on other blogs, so I will not say much about it. And yes, I think the violence is gratuitous in this miniseries. There were numerous times where fight scenes were completely unnecessary, and other times where the fight scenes seems to drag on and on, but then, they delete entire portions out of the Bible (such as all of Jacob’s story, the 40 years of wilderness wanderings, etc.) Couldn’t they have cut out the fight scenes and included a scene or two from these other crucial events? I am not trying to sweep the violence of Scripture under the rug and ignore it, but when God’s angels start pulling out their swords to hack people to pieces (as in the scene with Sodom and Gomorrah), it’s a little too much. I don’t know about you, but I find it impossible to take the Jesus I read about in the Gospels, and put Him back into almost any violence scene in the Old Testament. The Jesus I read about in the Gospels has compassion on the multitudes when they are hungry. Would this same Jesus give praise to God if He were on the boat with Noah while mothers and babies screamed on the outside as they were dragged to a drowning death? Ultimately, then, it comes back around this question: Does Jesus fully reveal God to us or not? If He does, then how do you make sense of the bloody and violent texts of the Old Testament, and the complete lack of such violence from Jesus in the Gospels? This is why I am trying to forge an explanation with my “When God Pled Guilty” series. Frankly, I am quite excited about some recent developments in this series, but I know for a fact that when I am done, my proposal will not be fully satisfactory (even to me). They chose the stories they did (leaving out Jacob, for example) because the entire series is running on a theme of “saviors of Israel,” leading up to the Messiah. Abraham, for example, is highlighted as being the man willing to sacrifice his own child for a greater cause (like God); hence, why he is chosen to be the father of a mighty nation. That being said, the violence bothered my mother as well. It didn’t bother me so much, or my dad, but she actually refused to continue watching it after a certain point. Ah. I didn’t recognize the parallelism. Of course, this raises the question even more … why are so many of the savior’s of Israel so violent when Jesus is not? How can a loving merciful God kill the first born of Egyptians, just because the pharaoh did not believe? I’m pretty sure the first born really had no idea of the battle between Moses and the pharaoh. The common people of Egypt suffer because GOD wants to convince the pharaoh how powerful HE is? The pharaoh makes a choice and the common people die and go to hell for it? It just does not make sense to me, that JESUS would do this. The only thing I can say is GOD does what HE does and that’s it. Part of HIS will, the big plan. It just seems contradictory to JESUS. Can you explain this away? Excellent, excellent question. It is THE question. Christians have never had a good answer to this question, and so it is fully understandable why many people don’t want to worship a God who slaughters babies in their sleep. It’s despicable. Anyway, I do have an answer, and will be posting it here on this blog in a month or so (it is part of a book I am currently writing on this very topic, and so the posts need to go up in order). Haven’t seen the series but will take a shot at your question. Beyond the violence in the OT, there’s the bigger story of the battle between God and Satan, good and evil, that continues. That battle is still violent. . . just that the battleground has shifted. In the OT blessings and battles were material and physical. . . now they’re spiritual but the battles are intense and faith is a fight. That which wounds and kills the soul is worse than what is done to the body. . . broken hearts are harder to heal than broken arms and legs. Thinking hell is a place of torment not because of pain to the body but to the soul. . . can’t imagine what it would be like to be eternally alive and knowing and yet be “away from the presence of the Lord and from the glory of his might.” Don’t know about you, but know what I am apart from Christ. . . what would it be like to be left to what I am in myself, alive forever, knowing there’s a God but can never be in Him and without any power to get there? Fire penetrates deep, no rest for the soul. Thinking that souls are eternal, that God is merciful to everyone that way. . . that we’re left to our own choices and what comes of that, can’t hang that on God. Yes, there is definitely a spiritual battle going on, and we are living in a war zone. In a war, terrible things happen, and there are casualties. However, do you think we can say that God himself sometimes causes the “collateral damage”? Hey man, not sure if that question’s rhetorical, but sometimes seems this whole human experiment is a failure. . . that the only way anyone is like God in character is by being delivered and saved. Amazed that it takes the same power spiritually that God has to hold the universe together to raise and make us alive in Christ. . . almost seems like it takes more power to fashion a heart in us that is fully set on him. He has the power, not sure why he doesn’t make all alive in Christ since he could. Not sure why he doesn’t stop the slaughter of brothers and sisters by Boko Haram in Nigeria. But not thinking God is not love because he doesn’t save all. 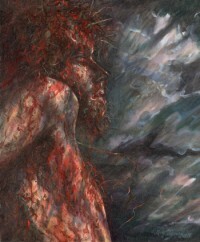 . . is he unloving because he doesn’t save Satan, he’s created too. Thinking God is loving doing what is needed to get us home. Know that brothers and sisters in Nigeria that remain have this living union with God in Christ that enables them to stand in the slaughter and have love for their enemies and be genuine in this world. Wow, tough questions. These are the hard questions. It is easy to theologize, but the sorts of questions you are asking is where the rubber really hits the road. I think God is doing everything He can to get us home. I like the imagery on that. I don’t think, however, that this involves God killing people. If our struggle is not against flesh and blood, then I don’t think God’s is either. We are living in a warzone, though, and in war, bad things do happen. There is a fuller answer, but I will try to address it more deeply in the book. Thinking violence is just the far end of the spectrum of everything less than God saving. For me the greater question is that infinite love and infinite power doesn’t save everyone. Instead seem to find the opposite. . . “though they were not yet born and had done nothing either good or bad. . . Jacob I loved but Esau I hated.” God chooses, and favors his choice. . . “For I am the Lord your God, the Holy One of Israel, your Savior. I give Egypt as your ransom, Cush and Seba in exchange for your life. Because you are precious in my eyes, and honored, and I love you, I give men in return for you, peoples in exchange for your life.” Is infinitely powerful love obligated to save everyone, or can He make choices? If He chooses not to save everyone, is He no longer loving? For me the more compelling issue is the love of God, not the violence of/against man. Should have added that while the answers I come up with are just questions, know that in the end God’s choices will be vindicated. . . that what He has chosen to do will be the most just, the most righteous, the most loving. Forget who said it but it is an arrogant/risky proposition for man to call God before the bar of justice. For me, don’t want my ignorance and lack of answers to cloud the beauty of who God is. Lots of times on this journey lack understanding of the why’s. . . can struggle for answers that do not come, but then always find faith is the answer. . . doesn’t always satisfy the head, but settles the heart. If Christianity is simply the “invention” of humankind and not divinely inspired, then it is possible to have a diety that can be simultaneously cruel and loving because it is the invention of human beings. It is their “concept” of right and wrong we are experiencing and not that of an omnipotent being. Some call those books the “Old Testament”. Other call them the “Hebrew Testament” or “Jewish Testament”. Although people use those terms for a variety of reasons, I do know those who think those books tell stories of the religion and culture of the ancient Jews, and as such are only history. That implies many things, but of course it means Jesus wasn’t there because he had yet to be born. Yes, I tend to refer to them as the “Hebrew Scriptures” but also refer to them as the “Old Testament” so people don’t get confused. I think the “Old Testament” is a bit derogatory… Regardless, I agree that they do tell the history of the ancient Jewish people and their religion. As such, this means that modern Western Christians need to be very careful how we read, understand, and apply the Hebrew Scriptures. They are not instructions for us or for our time. Then there is the person who sees love as a noun. This person doesn’t view scripture in a linear fashion. He believes that linear interpretation of the bible leads to irreparable contradictions. Therefore, he interprets scripture through a different lens. To him, God’s essence/nature is love, and all his attributes come from his nature. If there are attributes that mitigate against God’s essence, for instance wrath, then this person assumes either God has been misunderstood or wrath has been misunderstood. So, and adjective or a noun? Essence or attribute? There’s a big difference. Interesting. I tend to believe Love is a verb. How would that affect what you are saying? I like your point about the non-linear nature of Scripture. Will be thinking on this more. I think that love is a noun that shows itself in our lives in verbs. Love is the image of God within us. It is the original design of the heart that has been twisted/marred by self. Some of us are twisted more than others, and our verbs/actions show the state of our hearts. As we allow, God’s spirit (love) comes into our lives and untwists us from the state we are in into a state of true humanness, beings created to love. Yeah, that’s probably a good way of putting it. I like the way you phrased it. Thanks! Jeremy, this is probably one of the most interesting, thought provoking, and important subjects that I have come across. I think of all of the various people that call themselves atheists because the traditional Evangelical Christian viewpoint about the God of the old testament is really quite absurd. It makes no sense. These are intelligent people and because it does not make logical sense they throw out Christianity and, unfortunately, God and Jesus go right out with the lot. I want so much for them to see who God really is and that is why Jesus came so that we could see and so we too, by the spirit of Christ, could show them. I think that I am beginning to see what is going on in the Old Testament. God is always given the blame, isn’t He?? Adam blamed God right from the very beginning for having given Eve to him. Is this what is going on throughout the whole old testament and still continues on to this very day? And is what happened to Jesus on the cross is that He took all that blame for all that sin upon Himself and put it all to death? Why?? Was it because it was God greatest desire to have a family to love, a bride for His Son and a dwelling place for Himself? He would take all the blame just for the sake of love. I am taking these thoughts from many things that I have read and trying to put together pieces of the picture of who God is. What do you think? Yes, yes, yes! You get it! Even today, we like to blame God for so many things, and while He wants us to see the truth of the matter, that we ourselves are guilty, until we come to realize that, He is fine taking the blame because He loves us so much!